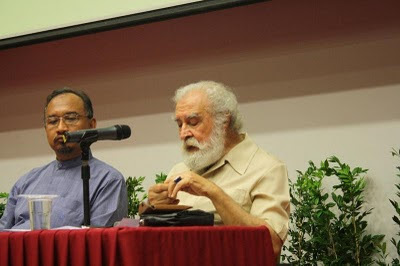 Prof. Wan Mohd Nor and Prof. Al-Attas during the special lecture in the seminar last year. If that is the case, that shows how persistent were the Christians in finding the loopholes be it in legal or cultural dimension to further their cause that might create confusion to the Muslim's polity if not being mitigated by the governing authority of this land. As I iterated before, by having confused so-called Muslim authorities which normally appear in the silhouette of Salafism/Wahabbism as well the Modernist/Reformist (actually they are just the two sides of the same coin), the "public sphere" itself has been flooded with confused views which do no good to the Muslim's cause in defending their creed from blasphemy. It is best to leave this matter to the Muslim scholars who have been trained as Theologians (mutakallimun), that possessed in depth understanding on Islamic Theology, Islamic and Western Philosophy as well knowledge about the Western Civilization (which Christianity is one of the mosaic part of the whole picture) to deal with this issue succinctly. Most of them that I have known are the young protege of Muslim scholars who being trained by Prof. Al-Attas himself during his days in the "original" ISTAC like Prof. Wan Mohd. Nor Wan Daud (ATMA-UKM), Assoc. Prof. Dr. Zainiy Uthman (IIUM),Prof. Alparslan Acikgenc (Fatih University), Dr. Mustafa Ceric (Grand Mufti of Bosnia-Hezergovina) , Dr. Zaidi Ismail (IKIM), Dr. Sani Badron (IKIM), Dr. Wan Azhar (IKIM), Dr. Farid Shahran (former VP of ABIM, IIUM) Dr. Wan Suhaimi Wan Abdullah (UM), Dr. Azizan Sabjan (USM), Dr. Adi Setia (IIUM ) Ustaz Asham Ahmad (IKIM), Ustaz Nik Roskiman (IKIM) while Prof. Al-Attas' students from Indonesia who have fought closely in this issue the likes of Dr. Syamsuddin Arif, Dr. Hamid Fahmy Zarkasyi, Dr. Adian Husaini, Dr. Khalif Muammar, Ustaz Adnin Armas, Dr. Ugi Suharto and many others. Do google their name for further references. For today's good article refer to Ustaz Asham's "Antara nama dan Hakikat"
1) "KALIMAH ALLAH: Hak Muslim atau Hak Semua"
Syarahan oleh Dr Farid Shahran. Anjuran: Intellectual Youth Club (IYC). Many thought that this is merely sentiment-centric issue. People who love to be different stirred on their chair uneasily and say. " Hey you. Don't jump off easily. Dare to be different". I will say to them. I love being different in many issues but not the one that I believe is not right based on the accurate methodology and discipline of understanding the knowledge. If 'they' say that they have a hujjah based on Quran and Sunnah and we say we got a solid one too. Only that it's follow the tradition of methodology istinbat, usul alahkam and nusus so that we DON'T only being illogically literalistic-is there a word for this? (zohiri moden. Dr Yusuf Qardhawi ada menulis tentang ini). Penganut Buddha boleh di anggap ahl kitab. sistem hieraki wujud Buddhisme sama dengan pandangan Ibn Arabi , maka di simpulkan bahawa "Dharma" itu adalah "Allah" jua dan Nama & Sifat Allah itu mendapat persamaan dengan "nama-rupa" dalam Buddhisme. sila rujuk Dr Reza Shah Kazemi dlm ceramahnya di IIAIS 7hb Jan 2010 dan dapatkan transcript atau ulasan dari IIAIS. apapun, sebagai seorang muslim, seperti yang dipesan oleh prof, mesti perjuangkankan "keagungan dan kesucian" kalimah 'Allah' ini. saya tak mahu melihat kelak orang memakai rantai salib/tatoo bertuliskan 'Allah' sambil minum arak dan membuat maksiat.